The strident communal overtones of the campaign being run by "the other" Gandhi son, Varun, contesting his maiden Lok Sabha election from this constituency, has left even workers of his Bharatiya Janata Party (BJP) shocked. The 29-year-old son of Maneka and the late Sanjay Gandhi - younger son of former prime minister Indira Gandhi - was Sunday issued a notice by the district authorities in Pilibhit, the constituency so carefully nurtured by his mother who gave up the seat to ensure his easy entry into the Lok Sabha. That she did so was no surprise for political watchers here. What has come as a shocker is his staunchly pro-Hindu and rabid anti-Muslim vitriolic that his opponents and supporters say could trigger a communal clash. From taking up issues like the ban on cow slaughter to asking a Sikh leader to leave a Hindu meeting, Varun Gandhi has been ruffling feathers everywhere. While "Jai Shri Ram" is his battle-cry at all roadside meetings or assemblies, some of the other slogans being used are "Gau hatya rukwana hai, Varun Gandhi ko jitana hai" (Cow slaughter must stop, Varun Gandhi must win) and "Varun nahin yeh aandhi hai, doosra Sanjay Gandhi hai (Varun Gandhi is like a storm, he is another Sanjay Gandhi)". On March 6, he said at the Dalchand meeting: "Agar kissi galat tatv ke aadmi ne, kisi Hindu pe haath uthaya ya hinduon ke upar yeh samajh key ki yeh kamzor hain, unke peeche koi nahi hai... hinduon ke upar haath uthaya, mein geeta ki kasam khake kehta hoon ki mein uss haath ko kaat daaloonga. (If somebody lifts a hand against Hindus, or thinks they are weak, there is nobody behind them, then I swear on the (Bhagvad) Gita that I will cut off that hand)." Naresh Verma, a popular BJP leader in Puranpur - within the constituency - told IANS: "I am a BJP activist and a Hindu too. But I am not in favour of launching a communally charged campaign. 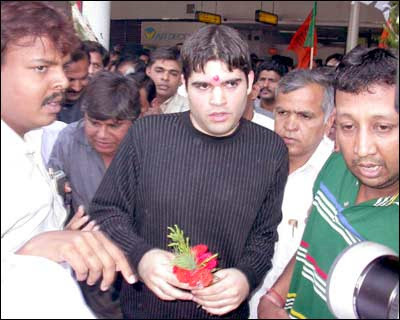 If Varun Gandhi persists with such style of campaigning, I would be compelled to keep myself away from it." Added another BJP veteran Gurdial Singh: "Varun is going out of hand. If he is not restrained, this election could end in a bloody communal clash." The 70-year-old Sikh froom Ramnagar village was even asked to leave one of the Hindu meets being addressed by Varun Gandhi. "He neither has respect for any other religion nor even for elders. In his arrogance, he has gone to the extent of forgetting that his mother was also a Sikh before her marriage." If the BJP is alarmed, other parties are determined to ensure that this stops. "We have audio-recordings of the provocative language used by Varun Gandhi to run down Muslims," claimed Haroon Ahmad, a local Samajwadi Party leader. Though Gandhi doesn't deny giving the controversial speech, he insisted the video had been "doctored" and that what he said was "mangled". "I believe very firmly that this is the result of a political conspiracy," he said. "This is not my voice, those are not my words. I've a soft voice, [but in the video] I sound like [Bollywood star] Amitabh Bachchan." The state election authorities have ordered an investigation, and the local police have registered a criminal case and sent the video for forensic tests. Gandhi is a candidate of the opposition Bharatiya Janata party (BJP), whose leaders often stridently promote Hindu causes. If the video is genuine, analysts say, it shows the extent to which some politicians would go to divide voters and win an election. "People who know Varun say he's a very intelligent young man," said Phadnis. "But sometimes people who are too sharp can end up cutting themselves." Muslims want Varun disqualified from contesting the upcoming general election, scheduled to take place in April-May. "He must be banned from contesting the election," says Shehla Masood. "I am a Muslim and proud to be one. I thank my ancestors and God that they did not choose Pakistan and chose to stay back in India," she added, referring to the creation of India and Pakistan 60 years ago after the end of the British mandate. "India is my country more than that of Varun Gandhi."